It was awesome, and I still remember some of its features. I also remember the little old lady two doors down who made blueberry pies and the nice old man next door who used to hand me pennies through the fence. Most of all I remember the train yard. It was just a few doors down. My dad used to wheel me out there park my stroller on the corner and let me watch the trains switching and staging. From as far back as I can recall, the sound of diesel rumbling, signal bells, and train horns has been a huge comfort to me. I love trains. 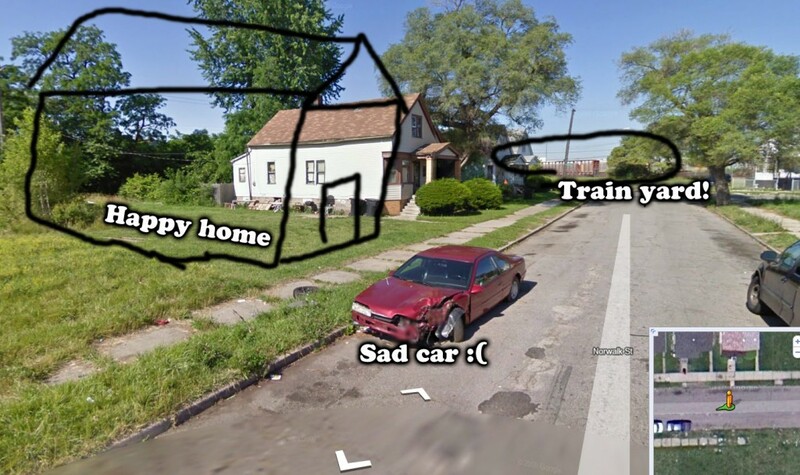 My parents decided that the neighborhood was getting bad, and in 1980 they moved us all to Center Line, Michigan. That’s where I grew up and I’ve lived in the suburbs ever since. It wasn’t a bad upbringing. The suburbs are nice enough. I had a few friends and I could ride my bike a half mile to a place where a lot more kids my age lived. Luckily, I lived around a lot of old Polish people, and there was something of a “neighborhood” feel to the place. But as I got older, the suburbs got less and less personal. All the old mom-and-pop businesses got replaced with Rite-Aids and CVSes, all the family-owned diners got replaced with chain restaurants, and eventually the big box stores like Home Depot, Super KMart, Meijer, and Wal-Mart moved in; they wiped out giant swaths of land to lay down massive parking lots (which never, in my entire life, have I ever seen even close to being filled to capacity) and take away all the business from independent stores with their convenience and lower prices. All sense of place, and of character, were slowly being erased by the sterile sameness of it all. I’ve traveled all over the US, and most small- to mid-sized cities are exactly the same. You can’t tell if you’re in Macomb Township, Michigan or Woodbury, Minnesota. It’s as if a gigantic, strip-mall sized rubber stamp has been slowly plodding its way from East to West across our beautiful, bountiful nation. Three guesses. You can’t possibly figure out which state this is in. I got lucky enough to get a job in Detroit in 1991. My dad got me a job at Randazzo’s Fruit Market at Outer Drive by 7 Mile Road. As a scrappy 14-year-old white kid from the ‘burbs, I got a massive (and hilarious) dose of education that summer. After that, I worked at a Kinko’s at 7 Mile and Mack. Then I went to the Wayne State Kinko’s on Woodward and Warren. From there, it was on to the Renaissance Center Kinko’s in Downtown Detroit. Then I worked for two years in Highland Park at a militant newspaper run by what were likely former Black Panthers. From there I went on to Greektown to work at a dotcom-era startup in the Boydell Building (before the casinos!). When I left that job to start my own company, it was only natural that I end up in Detroit, having spent most of my adult working life in the city. From 2001-2003 my office was in Detroit’s East side, at Harper and Whittier. It wasn’t a great area. We got robbed twice; when the great Northeastern blackout of 2003 came and wiped us out for a couple of days, that was our prompt to move into the suburbs (despite what Mayor Archer’s office said, there was looting in our neighborhood). That was the end of my professional career in Detroit. We moved our office all the way out to Madison Heights, but it just wasn’t the same. Since then, social media has entered my life. With it, I have made many new professional connections, many in Detroit. I’ve been to many events in Detroit like Ignite Detroit and StartupWeekend Detroit, and watched this tide of social media sweep over the city, bringing with it a message of hope, recovery, and excitement. Suddenly, the creatives and entrepreneurs were talking Detroit. Things were changing. Attitudes were shifting. People were realizing it wasn’t a nightmare of carjackings and shootings. People began to see that the media had been… well, I won’t say “lying”, but misunderstanding and heavily misrepresenting how bad things had gotten. I live in Warren, now. The real estate bust left my neighborhood’s home prices absolutely devastated. I bought my house for close to $150,000 in 2004. It’s worth about half that now. Most of the homes on my street were foreclosed and then re-bought by different people. It seems like foreclosure was really the only option for many people here. It sort of seems that way for me, too. My house payments are absurdly out of line for what this house is worth; and besides that, I don’t feel like I’m investing any more. I’m simply paying exceptionally high rent to live in a city that continues to fill up vacant buildings with liquor stores, check cashing places, and corporate chains. I’ve been feeling the siren call of my hometown Detroit for some time now; but finally everything started to click together as more and more people started talking about Woodbridge and Midtown, Boston Edison and Indian Village. Jobs. Investment. New companies. Neighborhoods. Families. Color. Culture. It’s what I want for myself, my kids, and my life. My roommate, best friend, and business partner Matt “Lincoln” Russell shares my love for the City. He and I have been talking about it for a few months now. We brought it up to my lady love, Nicole. At first, she was a little hesitant. Then we visited Eastern Market, walked the riverfront, visited downtown, and felt the vibrant energy. We took a drive through Woodbridge and saw the beautiful homes, the neighbors all outside hanging out, cooking, and talking. We saw the hundreds of participants of Critical Mass. We visited Neighborhood Noodle. We hung out in Mexicantown. I slowly introduced her to the city I know and love. Finally we all discussed it and started driving around Woodbridge and Midtown looking for actual homes. This house was $38,000. Seriously. That was the big step. Once we drove to Woodbridge, got out of the car, and started walking around looking at potential homes, it was almost a sealed deal. 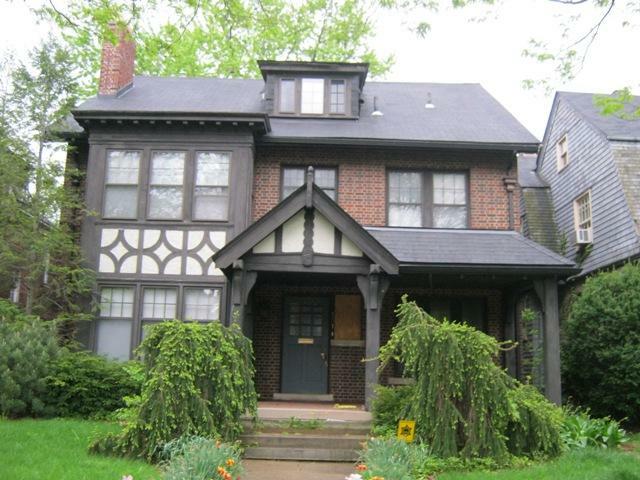 We looked at homes all over the area and Boston-Edison as well. So many stunningly gorgeous places, just waiting to be restored to glory. The possibilities are endless. We talked it over and decided to launch this site both as a journal for our adventures and eventually to serve as a community site for those who also love Detroit as we mean to. If you want to move into Detroit, or are just, you know, “into” Detroit, we plan on helping you all find an online home to discuss this great city. We do, after all, have some experience launching successful communities. There is a feeling in the air. There are so many people who articulate it better than I do, who bring us hope and good news about Detroit. The feeling says, “It’s time.” I believe, with all my heart, that Detroit is truly capable of being the renaissance city for the 21st century in America. We are starting over and building an absolutely stunning future, while not ever forgetting our past. It’s time to move back home. It’s time to move back to where I belong. For years, whenever I travel, I always tell people I’m proudly from Detroit. It’s time to make that a reality. Are you coming with us? This entry was posted in Moving to Detroit and tagged The Curator, The Developer, The Move by primesuspect. Bookmark the permalink. I've been feeling the itch myself. I'm visiting this week, from my new "home" in Seattle... and as I get older, I am feeling more and more of a draw. I'm not done yet, learning, exploring, gaining experience to bring back to the D... but getting closer and closer. You're our very first commenter ever, Elise! Thank you! I know exactly how you feel. It just never leaves you. And the idea that creative people are here feeding energy into the heart of the city leaves you with the itch to be a part of it. How can we not? Wow, I am SO inspired by this post!!! To hear your story really validates my feeling that Detroit isn't just GOING to turn a corner... it IS turning the corner. Now. I moved to Detroit from Ann Arbor in 2009 (prior to that was in Seattle). I'm not a Michigan native, and sometimes I've felt only the non-natives have faith in a new future for the city. Detroiters have had their hearts broken many times in the past, so I can't blame them for being jaded...and I know the old Detroit will never be again. But something different than the old Detroit is entirely within our reach. Maybe even something better...It really warms my heart to hear you're taking this chance on your old hometown. So excited for your adventure! I promise you, your faith will be rewarded as mine has been! Go Detroit! I'm from Portland, and my husband is from Ann Arbor/Plymouth. I'm always poking at him to consider moving there for the experience to building something amazing. My advice to you: 1) Preserve your tax base! It's the only way to fund a livable city. People move to PDX and don't want to pay for what they're using. Gah. 2) Set rigorous urban planning standards and stick to your guns. Even if people say it hurts business. You know what hurts business? If no one wants to live in your city. I think Detroit's learned that lesson, thankfully. I can't wait to watch your story unfold! Good start guys. This first post was a great read. Someday, I'm going to finally make it up to Detroit... I know I've been saying that for years, but I really do want to meet you guys in real life and see what Detroit is all about. I've flown through your now awesome airport once, and I've actually flown in once to go to a Michigan game in Ann Arbor, but I've never actually gotten to see the Motor City. I'm so happy to see that someone took this idea for a website and actually followed through on it.. While Detroit still has many problems, it is definitely reaching a tipping point that I believe will launch the city back into a resurgence. There is a draw to move downtown to be a part of the turnaround of this city... While it isn't going to be an easy fix, stories like the one you are sharing are going to go a long way to help make the dream of a vibrant Detroit a reality. Best of luck! I look forward to following along. Congrats on taking the first step! Like I said on your Google+ post - you'll love it down here! I grew up in the burbs not far from you and I really like it down here. There are times when it is trying (the glorification of a criminal ex-mayor, for example) being a Detroiter - but I certainly believe as Rebecca said, the old Detroit is gone - Long Love the New Detroit! I moved to the area in 2006 and my wife and I have been residents of the city since May 2009. I also work down here. We absolutely love it and I'm happy to provide any help I can in compiling resources, etc. Awesome! What info are you looking for? I'm hoping to compile some information here as well; like, "What are my internet options" and "Who do I call for garbage pickup", etc..
Love the idea of this community blog, Brian! And yes, you definitely know a thing or two about building a community. Mike lived downtown for 3 years, and I'm jealous that I never got to experience living in Detroit. The one main thing keeping us from moving there is the school system. We don't have immediate plans to have kids after the wedding, and I know we could send them to a private school in the burbs, but that's our biggest hesitation about moving downtown. Looking forward to following along as this site grows! You could also send them to Ferndale or Royal Oak schools. I'm right with you on being stuck with a badly underwater mortgage, wondering why I'm paying out my teeth for an "investment" I'll probably never recoop. What's your plan for what to do with the Warren crib? Honestly? I don't see I have any options, really. I have tried loan modification several times but the paperwork requirements are absurd (We need utility bills from your ex-wife that you divorced in 2007, etc.) and there's just no way I can hold on to a house that is worth half of what I owe. Yeah, I hear you... I've spoken with and read about a lot of people who've gone through the same thing, and we're kind of in the middle of trying to figure out some kind of solution for ourselves. The one thing that really strikes me as strange about all the stories I hear is that no two cases are completely alike. You'd think by now, with the scale of the foreclosure epidemic and underwater mortgages, that banks would have (or would be required to have by law) a standard M.O. for how to deal with this kind of thing. I mean on paper, working with borrowers to do a loan modification or short sale is a better deal for a bank than letting a house go into foreclosure, right? But it sure doesn't seem to be the case, and the recent Freep series about Fannie and Freddie showed as much. Anyway, don't mean to hijack your comments thread, but look forward to reading more. Trying to convince my wife that there are safe neighborhoods in Detroit.... harder than it sounds. It already sounded quite difficult!